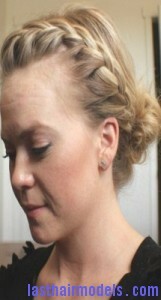 A lace braid is usually created in the front section of the hair. It is considered to be a classic and easy way to style your hair that is long. This style is perfect for almost every occasion and it can also help to keep the hair away from your face. 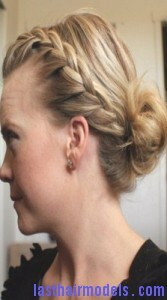 Instead of having the same old braid hairstyle, you can try something different like this to get a beautiful look. 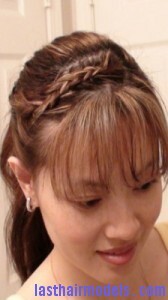 This style is in contrast to a traditional three-strand braid. There is no need to get any advice from a hair expert to get this type of hairstyle as it can be done at home without any assist. It is easy to create a lace braid, first divide the hair in the front of your ears. Then start braiding the hair all the way down to the side of your head with the lace braiding technique by separating the hair into four different parts. Now pass the fourth strand behind the third and second strands to make it emerge in between the first and second strand. Continue the braiding process till the end of the hair. 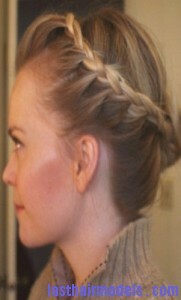 If you are planning to leave bangs try to blend them into the braid. Next secure the hair with a clear, elastic band and sweep the length of the hair in a high ponytail at the crown of your head. Finally spritz all over the hair with a finishing hairspray to get into the look.